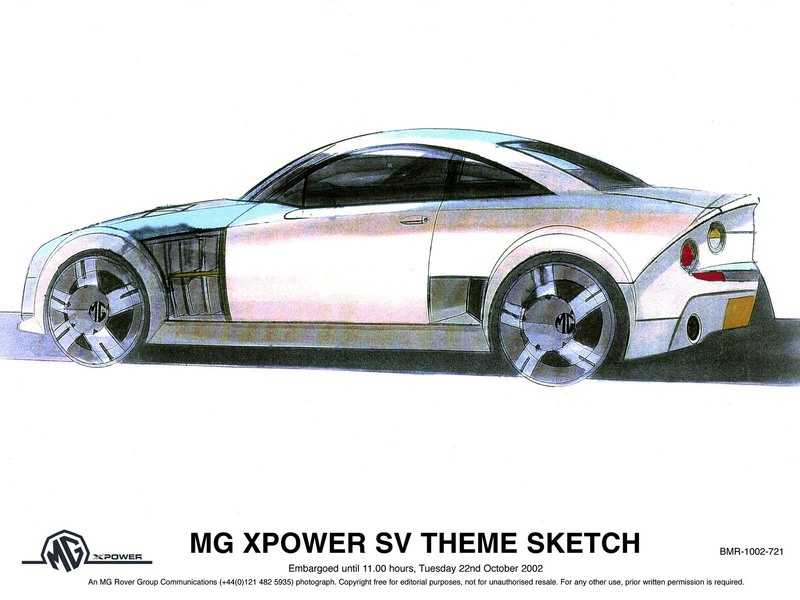 In 2003, MG Sport & Racing announced the sales launch of the MG XPower SV. The entry level model is powered by a 320 hp 4.6 litre all aluminium quad cam V8 engine which propels the MG XPower SV to 60 mph in 5.3 seconds and on to a top speed of circa 165 mph together with Automatic and higher powered SV-R versions. The first class performance of the SV is complemented by its distinctive interior. In keeping with the vehicle’s sporting heritage both front seats are specified with full inertia four belt harnesses, which are lockable for serious driving by the flick of a switch. Each cabin is trimmed with the customer’s choice of six leather finishes. Competition seats and fascias are available in a combination of leather and Alcantara allowing each vehicle to be uniquely personalised. 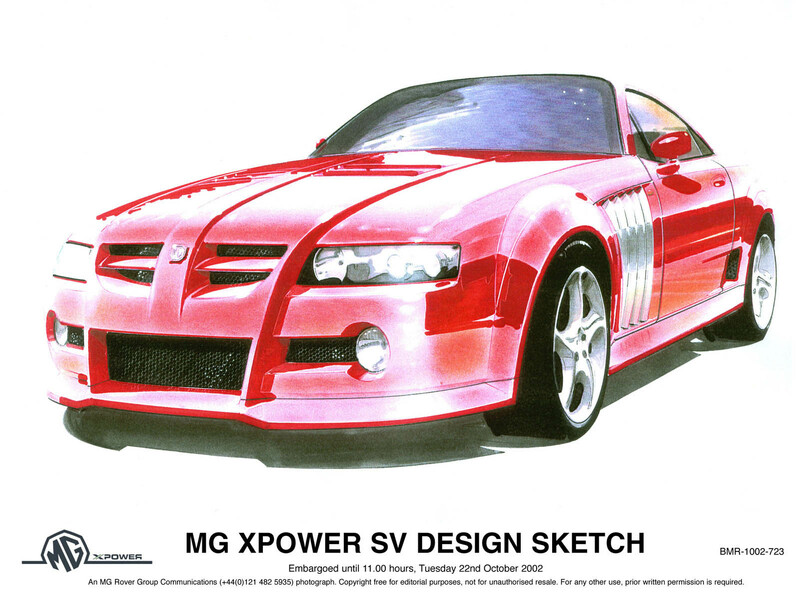 Designed by a team led by Peter Stevens, whose previous designs have included the McLaren F1, the MG XPower SV benefits from state of the art technology. Central to the car’s DNA is a finely tuned chassis designed along race car principles bonded to a lightweight carbon fibre body with an integral rollover cage. 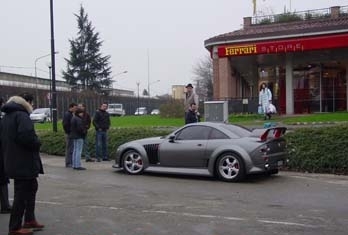 The chassis and carbon body were both constructed in the heartland of the Italian super car industry. Final vehicle assembly took place at MG Sport & Racing’s newly established HQ at Longbridge, Birmingham by a dedicated team of skilled craftsmen. 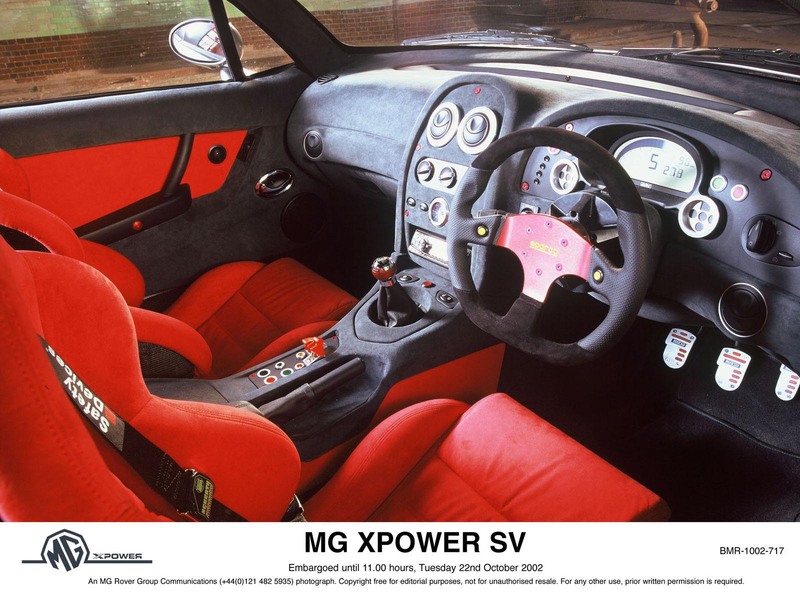 Directors of MG Sport & Racing commented “The MG XPower SV, which combines high reserves of power and motor racing safety features, is a true race car which has been built for the road. It can either lead on the track or cruise along the King’s Road. It is the ultimate MG.
Former F1 driver Mark Blundell said: “The MG XPower SV is aggressive and raw, and at the same time stylish and refined. 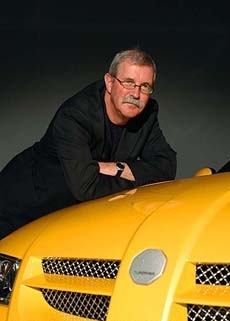 I have driven many of the world’s top sports cars and this car is in the same league. From the unique sound of the exhaust to the precision steering the MG XPower SV has all the qualities I look for in a sports car”. The SV range features an immensely strong box frame chassis allied to a uniquely constructed carbon fibre body shell which is instrumental in keeping the kerb weight to a competitive 1540kg and the centre of gravity as low as possible. The MG XPower SV sprints from rest to 60mph in 5.3 secs and on to a top speed of around 165mph. The range is aimed at individuals who share a passion for high performance sports cars and like to test a car’s abilities to the full. The MG XPower SV is an exhilarating, but above all responsive and well-mannered car that is equally at home driving to the race rack as it is performing on it. The SV is an all-new design from the team led by Peter Stevens, whose portfolio includes many renowned sports cars, until now pinnacled by the McLaren F1. The steel chassis and double wishbone suspension are fabricated by Vaccari and Bosi in Modena in collaboration with MG Sport and Racing’s chassis development team. In a bold departure from normal practice, a composite carbon fibre body using a groundbreaking process new to the motor industry, is used instead of more traditional steel or aluminium. With techniques developed by the UK based SP Group the body panels have the same stiffness as steel but at only 25 percent of the weight, a key requirement for a performance sports car. The entry-level car, the 4.6-litre engine is mated to a 5-speed Tremec manual transmission with drive to the rear wheels via a BTR limited slip differential. An automatic gearbox will be available early next year on the MG XPower SV-R.
With leather and Alcantara clad competition seats each customer has a choice of six interior trim colours matched to a wide range of exteriors colours. However a bespoke interior or exterior can be selected via the customisation programme. X80 prototype with a front splitter, rear diffuser, side vents and a rear wing being available for all cars. This offers the driver the optimum balance of driveability and aerodynamics. Extensive aerodynamic testing has been carried out in wind tunnels, on the high speed Nardo test track in Southern Italy and the Nurburgring Grand Prix circuit in Germany . Standard fitment in every car is the latest Tracker system from Omitec which not only enables the car to be located and immobilised, in case of theft for example, but also links the vehicle to a central diagnostic control centre at Longbridge. The system can be locked at the flick of a switch for more serious driving. Standard fitment for the MG XPower SV are O.Z. split rim 8J x R18 wheels shod with 225/40 ZR 18 tyres at the front and 10J x R18 with 265/40 ZR18 tyres at the rear. 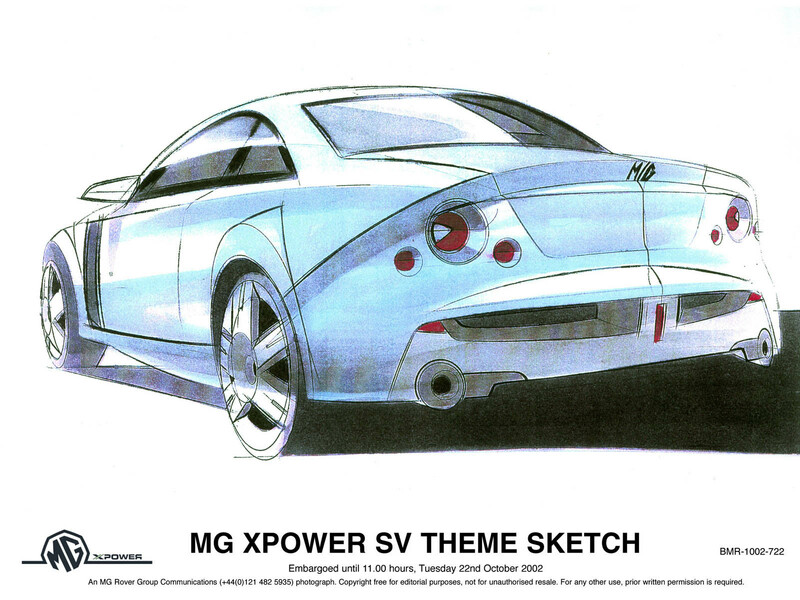 The MG XPower SV-R will sport a new MG designed wheel manufactured by O.Z. 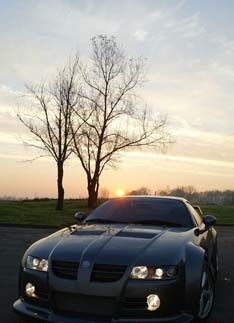 The overall effect is a low and aggressive coupe, capable of extremely high performance.